Wow, the wedding reception in Bay City was perfect! We provided Chad and Anne with Lighting Design for the entire room @ the Double Tree Hotel in Bay City. Basically we setup about 40 light fixtures around the perimeter of the hall (and some under the head table) so that they would change colors as the evening progressed. Since our Lighting Design is computerized we could change any wall any color @ any time. For dinner we had a very nice fade between a variety of colors that Chad and Anne wanted. A couple of things I noted throughout the evening, was that our clients really tied their theme together nicely! 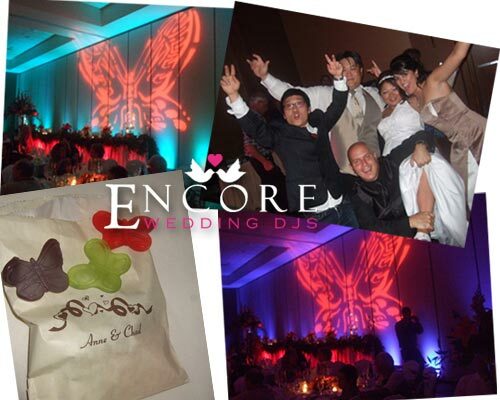 Since this was a fall wedding, we went with fall colors for their big day, and we even provided them with a custom butterfly design that was projected behind the head table in the color of their choice (we went with a vibrant fall red, image pictured above). Towards the end of the evening, the banquet staff setup an area for guests to grab candy and they even had butterfly gummies for the guests (I have a picture of this above). They even used a bagpiper for their grand entrance into the wedding reception. Overall everything went above exceptional, and Anne even told us that the Double Tree Hotel wants some pictures from their wedding because they never had their facility look like what we did to it. Ha, they want to use our work in all of their advertisements. That is like the ultimate compliment to us when another vendor appreciates our work. Do you want to see what our Lighting Design looks like when it is changing with the beat of your music? Click the link above or checkout any of our photos on our webiste. It will take you to some footage of guests having an awesome time at their reception. Thanks Anne and Chad you guys rock, enjoy the beautiful weather in Florida!